Above photo courtesy of Iowa State athletics communications. Through the miracle of technology, I was able to communicate with my former self via AOL Instant Messenger. The AOL IM service was officially retired a couple of years ago, but with a loophole in the software, I found a way to have a conversation with my 16 year old self in February, 2001. Bblum2019: Hey man, it’s you from February, 2019. Bblum2001: Whoa, wait, how do I know it’s me…or you..or whatever? 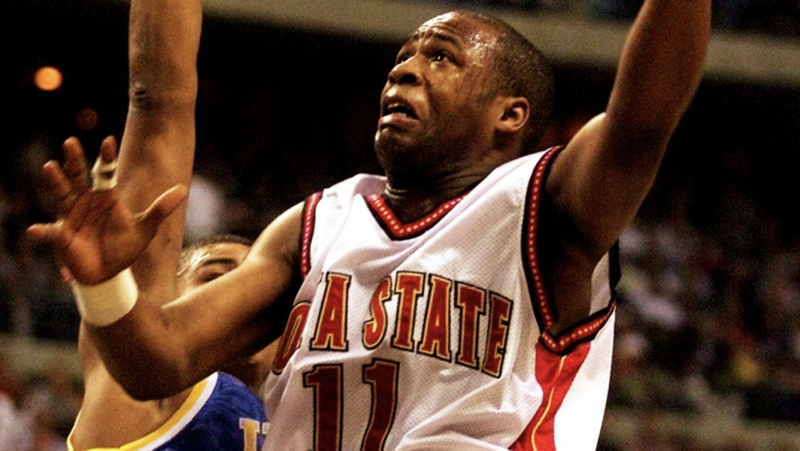 Bblum2019: You know that Kelvin Cato Trail Blazers rookie card, yeah, still have it. But it’s somewhere in the basement with the Troy Davis and Victor Alexander rookie cards. Too much baby stuff in the house now. Bblum2001: A baby? Dude! That means…slow down a second. Am I married? Bblum2019: Yes, married, with a kid, it’s actually pretty great. First piece of advice: quit worrying about girls so much, not worth the headaches for a long, long while. Bblum2001: Cool… well that winter dance didn’t go very well this weekend anyway. Date found some other guy during the new Shaggy song. But feeling good because the Cyclones just beat Kansas on the road for the second year in a row last night! Kantrail hit one from the KU logo! 8-2 and in first place again! Five in a row over the Jayhawks, we own them. Bblum2019: That’s actually why we need to chat. This is going to be hard to hear, but enjoy the next month of Cyclone Basketball because…. Bblum2001: Whatever…we have Coach Larry and Jamaal and Kantrail and Rancik and two sweet freshmen in Sullivan and Power, time to get revenge on Michigan State and get to the Final Four where we belong. We’re rolling. Bblum2019: Well, things get pretty interesting soon. I’ll spare you the details because adversity builds character, but never trust Pirates and let’s just say Kansas is not going away anytime soon. Bblum2001: That guy Roy Williams keeps stealing our players, so whatever. Bblum2019: He will keep doing that, actually you know that 3rd grader from Ames named Harrison that you just refereed in that youth league on Sunday? He and Roy Williams will cause some heartbreak down the road. And yet, it’s not Roy that will inflict the most damage in the Big 12. As I write this in 2019, Kansas has now won or shared 14 straight conference titles and Roy hasn’t been a part of any of them. Bblum2001: Gross. So that means? What happens to Iowa State? Bblum2019: There will be good times, there will be great times, there will be bad times. And some weird times too. Fred Hoiberg gets involved again at one point. It’s a roller coaster, really. Bblum2001: That seems really strange. Bblum2019: It’s actually quite a journey and a good preparation for life. Not everything is easy all the time. But as you’ll come to understand, the tough times makes the good times even better. Bblum2001: You sound old now. Bblum2019: But back to my point and some good news about our favorite Cyclones. 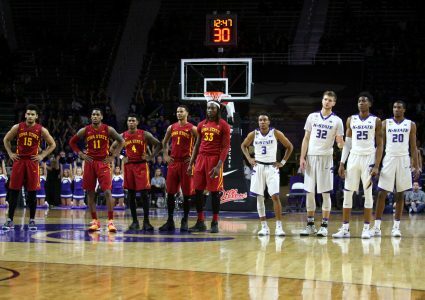 The Cyclones make a resurgence in basketball along the way and in 2019 and are in a position to do something not done in a while. Iowa State hosts TCU on Saturday and could go 8-3 in the Big 12 for the first time since you’re reading this in 2001. Cyclones are in a battle at the top of the Big 12 with Baylor, K-State and Kansas of course. But Iowa State is in the best shape it has been this late in the season to win the conference since Jamaal and Kantrail were on the floor. The Cyclones have a great combo of guards that are probably the best in the league and have shown some real grit and toughness lately. As you know (and will know even more in a month), guards win or lose games in March. With a legit rim protector and some options off the bench, I think this team could do some really special things. They are in the top 20 in the country right now and trending in a great direction. While we’re on topic, the women’s basketball team is also ranked and having a special season as well. They have a Canadian named Carleton that is really similar to that senior you’re watching now in Megan Taylor. In fact, the 2019 men and the women are both ranked for the same time this late in the season since… 2001. Bblum2001: Whoa, that’s a lot. Bill Fennelly has to be gone by now right? Baylor is good? TCU is in the Big 12? Bblum2019: Coach Fennelly is still going strong in year 24, he’s been the one constant for Iowa State over the years. And you actually get to broadcast some of the women’s games on the Cyclone Radio Network and do some football and other stuff on TV as well, you’ll love it. Although that growth spurt never really happens so when you work with Sage Rosenfels they make you stand on a box on TV. We’re still not sure about Baylor on a lot of levels, but TCU is definitely in the Big 12. By the way, we watch TV and movies on our phones now and cars can’t quite fly, but some cars drive themselves. Bblum2001: Sage Rosenfels? He’s about to go to the NFL. That sounds awesome! I do wonder how we’re going to replace him at QB. I guess we just got a former cornerback from Oregon State named Seneca. Seems a little risky. Can you still play Snake on your phone? Got a high score the other day. Bblum2019: You’ll be amazed. Well, I have to go. Big weekend ahead at Hilton, may even have a beer or two between games. Bblum2001: Beer? Those WHASSUP commercials are cool. Any more advice before you go? Bblum2019: A few things…invest in Amazon, Apple and Google and not Chizik coins. Spend time with friends and family as much as you can. And always trust the process…this will make sense eventually. Bblum2001: Sweet, thanks I think. I have some ER to watch. Later.